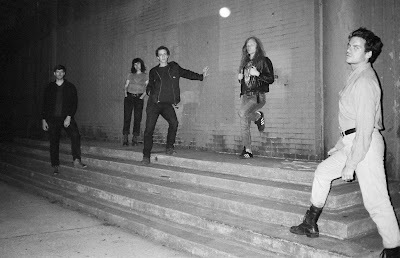 Stream the debut LP from New York's Big Huge. Big Huge delivers their politically-charged debut as a perfect blend of pop and angst, a wall of sound that functions as a mouthpiece for frustrations and grievances. Classic rock influences and jangly, harmonized guitar hooks give the album an addictive, feel-good vibe. On the contrary, vocalist Dan Reg brings a dose of pain and unique emotion to the band’s sound with their passionate howl. Seven out of the eight songs on the album are fast-paced, with blown-out instruments and energetic, precise drum fills. "Cop Blue" turns up the speed to a whole new level for a fury-filled whirlwind inflamed by squealing riffs and Reg’s borderline-screaming vocals. Immediately following is the band’s slowest new track, "Good Ol’ Boy," which keeps the energy of the album strong with ripping technical guitars, but the drums are gone, leaving us with a softer ballad-esque banger. It even features soothing background vocals and classic-style “ahhhh’s” for a comforting, vintage sound. I would dance to any one of these songs, or even the entire album, if it started playing in a public setting - it's just that good. Listen to Cruel World in full below and read some words from the band on creating the album. "In the mangled heap of a humanity taught to sink to the bottom or exploit to the top, we are quick to believe we've breached beyond the pit of this depravity unscathed. But at what cost came that supposed glimmer of light? Are we convinced we compete in a playing field so fundamentally and institutionally unleveled? Are we patrons to a system of power sustained only by its selective oppression? We forfeit empathy to ambition. We estrange, digitize, and withhold from the accountability of human connection to survive in an increasingly absurd CRUEL WORLD. In this pitch black place, ascension is just an illusion. Our singular pursuits may inch higher, but with each transgression against solidarity, we dig our place deeper down a mortal trench. We bang at a door above that does not open, and yet it begs of us to keep on knocking. Though perhaps, the only way out is not up - but through. Flailing. In the thick of it all. If we let the backbone pop, the knee bend, the joints clash against all those contorting souls in our midst, what do we have to lose except the fallacy of our isolation in the dark? If the limbs go akimbo and the neck ajar, if we give - give of the whole and unabashed self - What then? With only the weapon of our honesty, our vulnerability, our personhood - perhaps that which has been denied will thrash in time with all that surrounds - railing in tandem to be free. We are all we have. If the door will not open, we'd be wise to step outside." Listen to Big Huge on bandcamp.